London: Thornton Butterworth Limited, 1923. 1st Edition. Hardcover. Good. 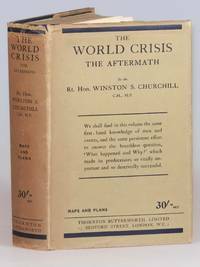 Here is a full British first edition set of Winston Churchill's The World Crisis published between 1923 and 1931. 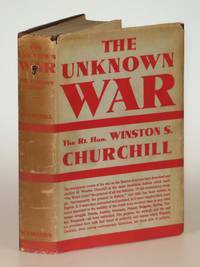 Of The World Crisis, Churchill bibliographer Frederick Woods wrote: "The volumes contain some of Churchill's finest writing, weaving the many threads together with majestic ease, describing the massive battles in terms which fitly combine relish of the literary challenge with an awareness of the sombre tragedy of the events." Churchill was in a special position to write this history, having served both in the Cabinet and on the Front. He served as First Lord of the Admiralty from 1911 until 1915. After the failure in the Dardanelles and the slaughter at Gallipoli Churchill was scapegoated and forced to resign. He spent his political exile as a lieutenant colonel leading a battalion in the trenches. 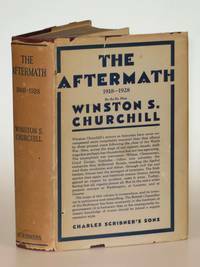 Before war's end, Churchill was exonerated and rejoined the Government, but the stigma would linger. 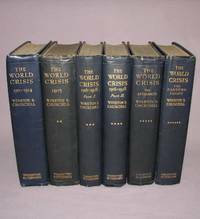 Churchill may have meant for his history of the First World War to clear his name, but his six volume masterwork far exceeds this purpose. Many consider the British edition aesthetically superior to the U.S., with its larger volumes and shoulder notes summarizing the subject of each page. This is a respectable full set of British first edition, first printings. Condition varies from very good to good minus. All six bindings remain square with the original bindings intact. Wear varies from very light for the 1911-1914 and two 1916-1918 volumes to moderate for The Eastern Front, and heavier for 1915 and The Aftermath. The 1915 volume suffers more scuffing and dulling than the other five volumes. The Aftermath suffers from some wrinkling of the spine cloth and from a considerable case of the blistering of the cloth endemic to this edition in general and this volume in particular. 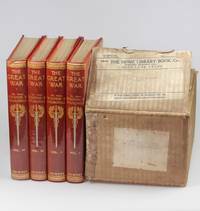 The contents of all six volumes are much better than average, with only light spotting that appears confined to page edges and the prelims of The Eastern Front. The Eastern Front is nonetheless a very nice copy of the elusive first printing with all maps and illustrations present, including the 8 photograph portraits and the notoriously fragile folding color map at page 368. The decorative bookplate of Arthur D. Fanshawe is affixed to the front pastedown of the 1911-1914 volume. Admiral of the Fleet Sir Arthur Dalrymple Fanshawe GCB GCVO (2 April 1847  21 January 1936) joined the Royal Navy as a cadet in 1860. He went on to be Commander-in-Chief, Australia Station in 1902, President of the Royal Naval College at Greenwich in 1906 and Commander-in-Chief, Portsmouth in 1908. There is a single previous owner's name inked to the ffeps of 1916-1918 Part I and The Aftermath and two names (dated 1932 and 1941 respectively) inked to the front pastedown of The Eastern Front. Please note that this large set may require additional postage. Bibliographic reference: A69.2(I-VI), Woods/ICS A31(ab), Langworth p.105.